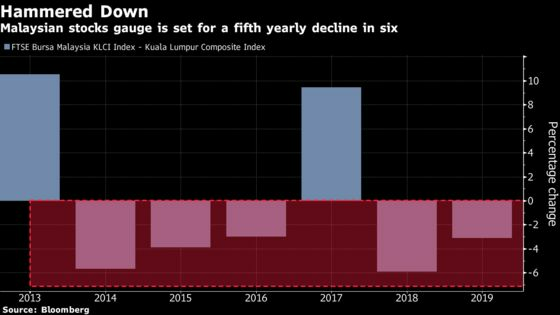 (Bloomberg) -- Hopes of luring back global investors to a battered stock market are dimming by the day for Malaysia’s government. The benchmark FTSE Bursa Malaysia KLCI Index is down 14 percent from a record in May 2018 and it’s the worst major market in the world so far this year, having slipped 3.6 percent. That’s even amid a rally in global equities spurred by the Federal Reserve’s dovish pivot and a potential trade deal between the U.S. and China. The gloomy outlook for Malaysian stocks isn’t likely to end anytime soon, says Samsung Asset Management Co. Euphoria about Malaysian stocks has faded after almost one year since Mahathir Mohamad’s surprise election victory in May, as the new administration struggled to clean up government inefficiencies and corruption. Unfulfilled campaign promises partly due to the legacy it inherited have also hurt its popularity. The new administration last month lowered its 2019 economic growth forecast and has been on an austerity drive to rein in its budget deficit. 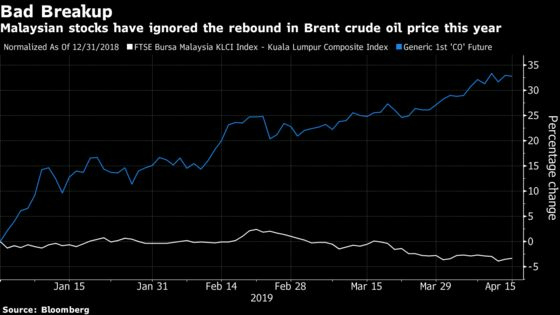 The KLCI gauge fell to its lowest since 2016 last week even as the price of crude oil, one of its major exports, has risen by a third in 2019. The stock index slipped 0.1 percent at the close on Tuesday. Foreign investors have dumped Malaysian shares worth more than a net $500 million so far in 2019, according to Bloomberg-compiled data. Malaysia’s central bank in March pledged to keep monetary policy accommodative as global risks weigh on the trade-reliant economy. Not everyone is bearish. Bharat Joshi, a Jakarta-based fund manager at Aberdeen Standard Investments, is “neutral” on Malaysia stocks and sees green shoots in infrastructure and oil-related stocks. Construction shares and oil and gas stocks will outperform the market following the resumption of talks on projects including the East Coast Rail Link and a rebound in commodity prices, he said.